This paper examines how understanding migration involves an appreciation of the experience of time in an unfolding life. The debate about belonging is so often coded around those who are seen to ‘really belong’ because they and their kin have put ‘time into’ society. Migrants by contrast are viewed as itinerant and passing through. Drawing on research conducted with thirty adult migrants in London over the past ten years we explore the politics of time in the context of the contemporary debate about migration. We argue that hierarchies of belonging are also accompanied by an ordering of the migrants’ relationship to time. We focus in particular on the experience of waiting as an existential straightjacket that restrains and comes to define life in the migrant city. Through the experiences of our participants we develop an analysis of the temporal-straight jackets or time traps that are produced within the immigration system. We show how participants in this study struggle to break free from these limitations through developing ‘vitalising strategies’ that help them move out of dead time and a future that is confined by a sense of their lives being ‘on hold’. Les Back teaches sociology at Goldsmiths, University of London. His work attempts to create a sensuous or live sociology committed to searching for new modes of sociological writing and representation. This approach is outlined in his book The Art of Listening (Berg 2007). He also writes journalism and has made documentary films. He has juts completed a book about the experience of young adult migrants in London with Shamser Sinha called Migrant City (published by Routledge later this year). This book is attempts a sociable sociology that re-design social observation so that participants not only observe their own lives but also become credited authors too. This paper explores how social scientists can understand the relationship between public policies and discourses on migration, public attitudes towards migrants and minorities, and everyday experiences of exclusion and conviviality, using the concept of “xeno-racism”, as developed by the late Ambalavaner Sivanandan. The paper will draw on fieldwork in inner South London, and focus in particular on what we can learn from psychosocial and ethnographic approaches. local authorities and mayors in particular play a crucial role in framing greater diversity as a complex but fundamentally fruitful outcome of globalization. (AMICALL) — Final Transnational Report (2012) see at https://www.compas.ox.ac.uk/media/PR-2012-AMICALL_Transnational.pdf . Over 11-12 April, Oxford hosted an extremely rich international symposium entitled Within and beyond citizenship: Lived experiences of contemporary membership, organised by COMPAS, the Refugee Studies Centre, the Oxford Institute of Social Policy and the School of Social Service Administration at the University of Chicago, and in particular by my colleague Nando Sigona, working with Jenny Allsopp and Vanessa Hughes. If you are interested, Nando has Storified the rich Twitter discussion that took place in the conference. I chaired and was discussant to a really interesting panel entitled The Roma at the margins of EU citizenship. There were three very good papers: Rachel Humphris, of the Insitutte of social and Cultural Anthropology at Oxford, with “Waiting room: Romanian Roma migrants’ negotiations of transitional controls in UK bureaucracy”, Julija Sardelic, of the CITSEE project at the University of Edinburgh, on “Romani minorities on the margins of post-Yugoslav citizenship regimes”, and Huub van Baar, of the University of Amsterdam, on “Boundary practices of citizenship: Europe’s Roma at the nexus of securitization and citizenship”. I have converted my discussant comments into a short report on those papers for this blogpost. At first glance, I was worried that the only thing the three papers shared was a common focus on Romani minorities in Europe, specifically those from southeastern Europe. Rachel’s deals with Romanian migrants in the UK awaiting the end of A8 transitional arrangements, Julia’s with Romani minorities in the former Yugoslavia caught in the cracks between post-Yugoslav statehoods, Huub’s with Kosovans facing deportation from Germany; all draw on very different bodies of theory to address very different questions. However, happily there are a couple of important areas of commonality. First, all three papers raise questions about the different scales of citizenship and its constellations and regimes, including the neighbourhood and municipal, the infra-national and national, and the space of Europe: scales which operate not as a nested hierarchy but in complex, contradictory ways, as palimpsest, with the residue of older citizenship regimes sedimented in the new (as with the legacy of Yugoslav federal and republican constitutions in the post-Yugoslav period). The space of Europe, with its shifting internal and external borders, is especially highlighted in all three papers, in a context in which, as Huub argues, the Roma have been discursively “Europeanised” as both icon or mascot and internal other of the European project. Second, all three papers deal with “in-betweenness” of various sorts. Julija takes Bhabha’s notion of in-betweenness as central to understanding the positioning of Romani minorities in central and eastern Europe, an in-betweenness systematically produced by the proliferation of national citizenship regimes which has rendered many within Romani minorities as de facto stateless or legally invisible. Similarly, Huub uses Nyers’ term, “the mezzanine spaces of sovereignty, that is, those spaces which are in-between the inside and the outside of the state” (2003: 1080). He also proposes the fruitful term “boundary practices of citizenship”. And in Rachel’s paper, we have a temporal in-betweenness: the state of being in waiting. This temporal in-betweenness is perhaps also present for the internally displaced in Montenegro, trapped in a recurrently extended formal transitional period, unable to provide the evidence that will give them permanent status (described in Julija’s paper), or for the German holders of the Duldung, a short-term reprieve repeatedly renewed (described in Huub’s). All three papers address, too, the vexed question of the agency of those with precarious relationships to citizenship, and in particular how we can talk about agency in the context of in-between spaces characterised by waiting, lack and dependency. Huub argues that a focus on spectacular “acts” of insurgent citizenship on one hand or exceptionalist security panics on the other leads us to neglect the importance of everyday, mundane, normal practices of citizenship and security. Huub gives us some cause for optimism by revealing the power of resistance, solidarity, innovation and knowledge-production in the most mundane contexts. Rachel similarly notes the development of “strategies of waiting” developed by Romanian Roma in precarious situations, and how they artfully navigate and even turn to their advantage the indeterminacy inherent in bureaucracy. But she also suggests a hinterland in which the most precarious and excluded have no room in which to wait, no space for hope. In Julija’s paper, agency is even more constrained: apart from an activist elite, subaltern Romani minorities are spoken for by others or, when they do speak, have their voices “transformed and interpreted [in] such a way that it only confirms the hegemonic ideology”. Central to the space of the normal is the banal figure of the street level bureaucrat, the low-level professional – the border official, gendarme, tax inspector, employment advisor. In contrast to the high visibility rhetoric of security and emergency most often invoked in the academic and activist literature, the street level bureaucrat often operates in a low visibility way. For example, Huub highlights how German and EU officials have sought to render more opaque “the most delicate trajectories of the physical procedure of deportation”, while Rachel talks of a bureaucratic regime increasingly physically removed from physical contact with “clients”, hidden on the other side of the screen or telephone. Also central to this space of the normal, in relation to practices of bordering and citizenship, are papers or documents, and the banal practices surrounding them – the birth not registered leading to a life of legal invisibility (as in Julija’s paper), the Duldung which grants temporary residence in the shadow of deportability (in Huub’s), or the compulsive collection of as many different types of document so as to strengthen a case against future deportation (in Rachel’s). The contribution of these papers is to show that examining these quotidian and material dimensions is crucial in pushing forward a critical account of citizenship, which requires a much more granular exploration of the texture of such below-the-radar mundane practices, a task which demands the development of more attentive (and especially ethnographic) methodologies. Melanie Griffiths, DPhil student at COMPAS, has published an article in Anthropology Today, Volume 28, Issue 5. “‘Vile liars and truth distorters’; Truth, trust and the asylum system” draws on ethnographic research to explore how those within the asylum system experience, understand and explain the bureaucracy they are embedded in. It suggests that deception, uncertainty and mistrust are as much characteristics of asylum seekers’ perspective of the immigration system as of the reverse. The journal also includes an article by Nando Sigona on“Deportation, non-deportation and precarious lives: The everyday lives of undocumented migrant children in Britain”. The UK is among the top ten destinations for migrants worldwide, and fears of our society being overwhelmed by migrants frequently surface in the immigration debate. But research shows that our perception of immigrants are more nuanced than assumed, and merely focusing on immigration as a threat is counter-productive. The average immigrant has a stronger sense of British identity than most home-born Brits – and children’s experiences are crucial to migrant families staying or leaving. Bridget Anderson, COMPAS Deputy Director, has produced a new Working Paper, What does ‘The Migrant’ tell us about the (Good) Citizen? The paper explores the tensions existing around the notion of citizenship and its effect on state inclusion or exclusion, and what they tell us about the nature of citizenship as a formal status, and about the nation as an imagined ‘community of value’, that is, status in the sense of value, worth and honour. It also examines naturalisation processes as attempts to match formal citizenship with the community of value. It argues for an analytical lens that enables us to consider the exclusion of non-citizens (migrants and refugees) alongside the exclusion of failed citizens (such as (ex)-prisoners and welfare dependents). So, I met HRH Princess Anne, the patron of NIACE. Here’s how the COMPAS website reported it. On 8 December Ben Gidley spoke at the NIACE event ‘Making a difference: Learning for citizenship in the 21st century’ in the presence of HRH Princess Anne. The National Institute of Adult Continuing Education (NIACE) conference highlighted the role of learning – both formal and informal – in shaping how and why we can become active citizens in the 21st century. Drawing on the perspectives of learners, practitioners, policy makers and researchers, the conference explored what it means to ‘participate’ as a citizen, examining the types of learning that foster civic activity, social networking, political processes and community life. 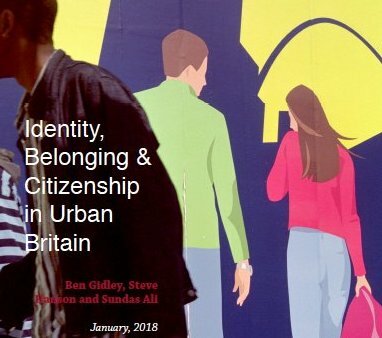 Ben Gidley, one of seven speakers, presented on “Who are the UK’s new citizens?”, presenting research conducted with Birkbeck, University of London on the Integration and Citizenship project. The research surveyed a large sample of people who applied for British citizenship last year, and conducted in-depth follow-up interviews with some of them.The research explored their journey from arrival to settlement to citizenship, their experiences of the naturalisation process (including the Life in the UK test), and their integration in terms of social interaction, local belonging and feelings of Britishness. The event was attended by HRH Princess Anne, who is patron of NIACE. Chris Taylor of NIACE was a particularly helpful member of our advisory board for the Integration and Citizenship project, which was funded by the European Union.